Chamomile (Matricaria recuita) is a flowering plant in the daisy (Asteraceae) family. Native to Europe and Western Asia, it's now found around the world. The herb smells slightly like an apple, which may explain its name—chamomile is Greek for Earth apple. There are two different chamomile plants: German chamomile and Roman chamomile. German chamomile, which is considered the more potent variety and the type most widely used for medicinal purposes, is the plant discussed here. Chamomile has been used as an herbal remedy since the time of Hippocrates, the father of medicine, in 500 BC. The list of conditions for which it's been used is extensive. It includes fever, headaches, kidney, liver, and bladder problems, digestive upset, muscle spasms, anxiety, insomnia, skin irritations, bruises, gout, ulcers, rheumatic pain, hay fever, inflammation, hemorrhoids, colic, and menstrual disorders. The generic name, Matricaria, comes from the Latin matrix, meaning womb, because chamomile was used historically to treat disorders of the female reproductive system. Germans refer to chamomile as alles zutraut, meaning capable of anything. Indeed, chamomile was considered such a panacea or cure-all that one writer described it as "the medical duct tape of the pre-MacGyver days." In modern times, chamomile is mostly taken orally to help with insomnia, anxiety, and digestive upsets, though it's also being investigated as a possible treatment for diabetes. It's also used topically to quell skin conditions and to help with wound healing. The research, however, isn't strong for any of these purported benefits because chamomile hasn't been well studied in people. Some of the purported benefits of chamomile likely stem from the fact that the essential oil and flower extracts derived from chamomile contain more than 120 chemical constituents, many of which are pharmacologically active. They include chamazulene (an anti-inflammatory), bisabolol (an oil with anti-irritant, anti-inflammatory, and anti-microbial properties), apigenin (a phytonutrient that acts as a strong anti-inflammatory, antioxidant, antibacterial and antiviral), and luteolin (a phytonutrient with potential anti-oxidant, anti-inflammatory, and anti-cancer activity). Whether as a result of these compounds or others, research shows chamomile possesses properties that can help ease inflammation, spasms, and flatulence, promote calm and sleep, and protect against the bacteria that cause stomach ulcers. Chamomile may be best known as a sleep aid, but the strongest evidence for the herb suggests it might be helpful for anxiety. Here's a look at the evidence as it stands in 2019. Chamomile is one of the most widely used alternative therapies for promoting sleep and treating insomnia. However, despite its reputation as an herb that facilitates sleep, there's little solid research supporting its effectiveness. Interestingly, despite the fact that it approved the use of chamomile flower preparations for a host of other purposes—including gastrointestinal spasms and bacterial skin diseases—in 1984, Commission E, Germany's counterpart to the U.S. Food and Drug Administration, did not grant approval for it as a sleep aid due to the lack of published research in this area. The few human studies that have been conducted are small, have design flaws (for instance, no control group), and show mixed results. For instance, in a 2011 study, 17 people with insomnia took 270 milligrams of chamomile extract twice daily (an amount that could only be achieved in a concentrated extract, not a tea) for a month and also kept a sleep diary. When researchers compared their diaries to those who took a placebo, they found no significant difference in how fast patients fell asleep or how much sleep they got. In contrast, a 2017 study of 77 older people in nursing homes found a significant improvement in sleep quality when participants were given 400-milligram capsules of chamomile twice a day for four weeks, compared to those who didn't receive any treatment. Similarly, when researchers in a 2016 study randomized 40 women who had just given birth to drinking one cup of chamomile tea a day for two weeks, they scored significantly lower compared to a control group that didn't drink the tea when it came to both sleep problems and symptoms of depression. However, the improvement went away four weeks after the women stopped drinking the tea, suggesting the positive effects of chamomile are limited to the short term. As for how chamomile might help induce slumber, animal research suggests it has both sedative and anti-anxiety effects. One study reported that apigenin, a component of chamomile, binds at the same receptor sites in the brain as benzodiazepines like Valium. Another study showed that chamomile extract at a dose of 300 milligrams caused a significant shortening in how long it took rats to fall asleep, while other research in mice demonstrated that chamomile can significantly prolong the sleeping time induced by sleep-inducing drugs like barbiturates. Research has shown chamomile to have meaningful benefits when it comes to reducing anxiety and the Natural Medicines Comprehensive Database, which rates the effectiveness of natural remedies based on scientific evidence, says chamomile is possibly effective for anxiety. The first controlled clinical trial of chamomile extract in 2009 found it may have a modest anti-anxiety effect in people with mild-to-moderate general anxiety disorder, one of the most common anxiety disorders. Participants took 200 milligrams to 1,100 milligrams of chamomile a day for eight weeks. A 2016 study found that taking 500 milligrams of chamomile extract three times a day for 12 weeks significantly reduced moderate-to-severe symptoms of generalized anxiety disorder, one of the most common anxiety disorders. In addition to soothing anxiety, research shows chamomile extract may also have antidepressant effects as well. Preliminary studies suggest that chamomile inhibits Helicobacter pylori, the bacteria that can contribute to stomach ulcers. Chamomile is believed to be helpful in reducing smooth muscle spasms associated with various gastrointestinal inflammatory disorders like inflammatory bowel disease, though research is needed to confirm that use. An animal study from 2014 showed that chamomile extracts have strong antidiarrheal and antioxidant properties when given to rats in a dose-dependent manner against castor oil-induced diarrhea and intestinal fluid accumulation. A 2015 study on more than 1,000 patients with acute diarrhea found that a commmercial product containing a combination of myrrh, coffee charcoal, and chamomile flower extract is well tolerated, safe, and as effective as conventional therapies. Topically applied chamomile may be able to speed wound healing. Studies show that substances in chamomile can kill viruses and bacteria, including Staphylococcus aureus, the cause of staph infections, reduce inflammation, and prevent and treat the growth of ulcers. One preliminary study that compared chamomile and corticosteroids for treating ulcers in test tubes and animals concluded that chamomile promotes faster wound healing: Animals treated with chamomile exhibited complete wound healing nine days before the other animals. Chamomile helped heal wounds in humans as well. In one small study that investigated the efficacy of a combination of lavender and chamomile essential oil on patients with chronic leg ulcers, researchers reported that four of the five patients in the chamomile and lavender oil group had complete healing of the wounds with the fifth patient making progress towards a recovery. Chamomile also proved superior to applying one percent hydrocortisone ointment in healing skin lesions after a surgical procedure in another study. Wounds treated by applying a chamomile compress for an hour once a day healed five to six days faster than those treated with hydrocortisone once a day. Still, more studies are needed. Chamomile is often used to treat mild skin irritations, including sunburn, rashes, sores, and even eye inflammations, but its value in treating these conditions hasn't been proven with evidence-based research. Topical applications of chamomile have been shown to be moderately effective in the treatment of eczema. In one partially double-blind trial carried out as a half-side comparison, a commercial chamomile cream showed a mild superiority towards a low-dose .5 percent hydrocortisone and a marginal difference compared to the placebo. Some studies have found that chamomile tea can lower blood sugar in people with diabetes. 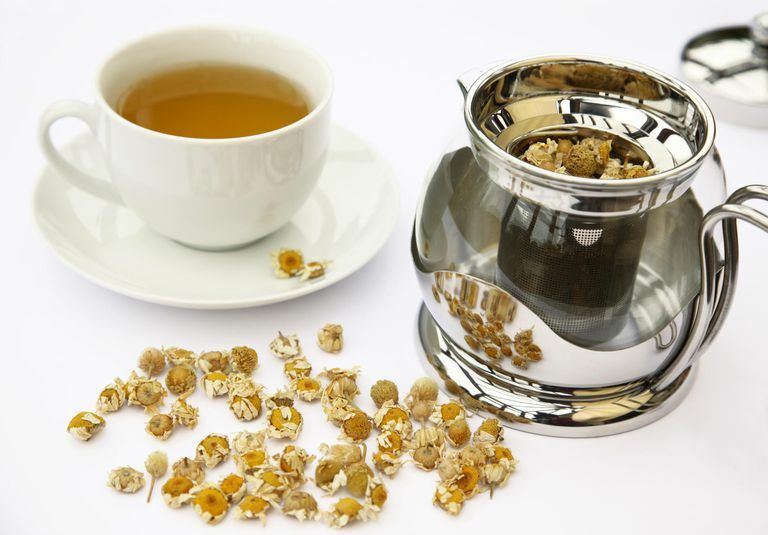 In one, 64 participants that consumed chamomile tea three times a day after meals for eight weeks saw significantly decreased markers for diabetes as well as total cholesterol compared to people who drank water. It also exhibited some anti-obesity activity. While chamomile may be a helpful supplement to existing treatments, researchers noted that larger and longer studies are needed to evaluate the usefulness of chamomile in managing diabetes. Some preliminary studies that evaluated the efficacy of chamomile mouthwash found that it significantly reduced gingivitis and plaque in comparison to controls, probably because of its antimicrobial and anti-inflammatory activities. To make tea, steep one heaping teaspoon of chamomile flowers in two-thirds of a cup of boiling water for five to 10 minutes before straining. You can also buy commercial teas. Chamomile is also available in capsules. As a gargle or mouth rinse, prepare as a tea, then let it cool. Gargle as often as desired. You may also make an oral rinse with 10 to 15 drops of German chamomile liquid extract (aka tincture) in 100 milliliters of warm water. There is no standard dosage of chamomile. Dosages used in studies vary. For instance, capsules containing 220 to 1100 milligrams of German chamomile extract have been taken daily for eight weeks to help alleviate anxiety. Chamomile is part of the same plant family as ragweed and chrysanthemum, so people with allergies to these plants may react—sometimes severely—when they use chamomile either internally or topically. Though reactions are reportedly more common with Roman chamomile, call your doctor if you experience vomiting, skin irritation, or allergic reactions (chest tightness, wheezing, hives, rash, itching) after chamomile use. Chamomile contains coumarin, a naturally-occurring compound with anticoagulant or blood-thinning effects. It should not be combined with Coumadin (warfarin) or other medications or supplements that have the same effect or be used by people with bleeding disorders. An isolated case has been reported of a 70-year-old woman who developed severe internal bleeding after drinking four to five cups of chamomile tea for a sore throat and using a chamomile-based skin lotion four to five times a day. The woman was being treated with the drug warfarin for a heart condition. It’s believed that the chamomile tea (and possibly the lotion) acted synergistically with the warfarin to cause bleeding. Due to concerns about bleeding, chamomile shouldn't be used two weeks before or after surgery. German chamomile might act like estrogen in the body. If you have any condition that might be made worse by exposure to estrogen, including hormone-sensitive conditions like breast cancer, uterine cancer, ovarian cancer, endometriosis, or uterine fibroids, don't use it without consulting your doctor. Interactions between chamomile and cyclosporine (a drug used to prevent rejection of organ transplants) have also been reported, and there are theoretical reasons to suspect that chamomile might interact with other drugs as well. Keep in mind that chamomile in any form should use it as a supplement to, and not a replacement for your usual medication regimen. Talk to your health care providers before taking chamomile if you’re taking any type of medicine. Giving them a full picture of what you do to manage your health will help to ensure coordinated and safe care. Be aware, too, that supplements haven't been tested for safety and due to the fact that dietary supplements are largely unregulated, the content of some products may differ from what is specified on the product label. Also note that the safety of supplements in pregnant women, nursing mothers, children, and those with medical conditions or who are taking medications have not been established. You can also get tips on using supplements here. Albrecht U, et al. Efficacy and safety of a herbal medicinal product containing myrrh, chamomile and coffee charcoal for the treatment of gastrointestinal disorders: a non-interventional study. BMJ Open Gastroenterol. 2015 Feb 6;1(1):e000015. American Botanical Council. Introduction to Chamomile. Chang SM, Chen CH. Effects of an intervention with drinking chamomile tea on sleep quality and depression in sleep disturbed postnatal women: a randomized controlled trial. J Adv Nurs. 2016 Feb;72(2):306-15. Della Loggia R, Tubaro A, Redaelli C. Evaluation of the activity on the mouse CNS of several plant extracts and a combination of them. Riv Neurol. 1981 Sep-Oct;51(5):297-310. Glowniak-Lipa Anna, Korona-Glowniak Izabela, Baj Tomasz. Anti-Helicobacter pylori activity in vitro of chamomile flowers, coneflower herbs, peppermint leaves and thyme herbs – a preliminary report. Curr. Issues Pharm. Med. Sci., Vol. 28, No. 1, Pages 30-32. Goes P, et al. Clinical efficacy of a 1% Matricaria chamomile L. mouthwash and 0.12% chlorhexidine for gingivitis control in patients undergoing orthodontic treatment with fixed appliances. J Oral Sci. 2016;58(4):569-574. Hartman D, Coetzee JC. Two US practitioners' experience of using essential oils for wound care. J Wound Care. 2002 Sep;11(8):317-20. Jarry Jonathan. Chamomile Tea, Will You Help Me Sleep Tonight? McGill Office for Science and Society. March 8, 2018. Keefe JR, Mao JJ, Soeller I, Li QS, Amsterdam JD. Short-term open-label chamomile (Matricaria chamomilla L.) therapy of moderate to severe generalized anxiety disorder. Phytomedicine. 2016 Dec 15;23(14):1699-1705. Martins MD, et al. Comparative analysis between Chamomilla recutita and corticosteroids on wound healing. An in vitro and in vivo study. Phytother Res. 2009 Feb;23(2):274-8. Mehrdad Abdullahzadeh, et al. Investigation effect of oral chamomilla on sleep quality in elderly people in Isfahan: A randomized control trial. J Educ Health Promot. 2017; 6: 53. National Center for Complementary and Integrative Health. Chamomile. Patzelt-Wenczler R, Ponce-Poschl E. Proof of efficacy of Kamillosan(R) cream in atopic eczema. Eur J Med Res. 2000 Apr 19;5(4):171-5. Pourabbas R, Delazar A, Chitsaz MT. The Effect of German Chamomile Mouthwash on Dental Plaque and Gingival Inflammation. IJRP. Spring 2005, Page 105-109. Rafraf M, et al. Effectiveness of chamomile tea on glycemic control and serum lipid profile in patients with type 2 diabetes. J Endocrinol Invest. 2015 Feb;38(2):163-70. Sebai H, et al. Antidiarrheal and antioxidant activities of chamomile (Matricaria recutita L.) decoction extract in rats. J Ethnopharmacol. 2014 Mar 14;152(2):327-32. Segal R, Pilote L. Research warfarin interaction with Matricaria chamomilla. Canadian Medical Association Journal, vol. 174, no. 9, pp. 1281–1282, 2006. Shinomiya K, Inoue T, Utsu Y, Tokunaga S, Masuoka T, Ohmori A, Kamei C. Hypnotic activities of chamomile and passiflora extracts in sleep-disturbed rats. Biol Pharm Bull. 2005;28:808–810. Singh, Ompal, et al. Chamomile (Matricaria chamomilla L.): An overview. Pharmacogn Rev. 2011 Jan-Jun; 5(9): 82–95. Soon-Hee Lee, Yong Heo, Young-Chul Kim. Effect of German chamomile oil application on alleviating atopic dermatitis-like immune alterations in mice. J Vet Sci. 2010 Mar; 11(1): 35–41. Viola H, et al. Apigenin, a component of Matricaria recutita flowers, is a central benzodiazepine receptors-ligand with anxiolytic effects. Planta Med. 1995 Jun;61(3):213-6. Zick Suzanna, Wright Benjamin, Sen Ananda, Arnedt J Todd. Examination of the efficacy and safety of a standardized chamomile extract for chronic primary insomnia: A randomized placebo-controlled pilot study. BMC Complement Altern Med. 2011; 11: 78.